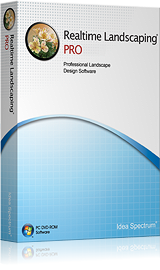 Learn how to quickly get started with designing your landscape. A more comprehensive guide on getting started with designing your landscape. The Landscape Wizard can be used to quickly set up a simple landscape. The Perspective View is the 3D view of your landscape design. Learn how to change your point of view smoothly. The Top Down View is the 2D overhead view of your landscape design. Learn how to pan and zoom with ease. The Top-Down View is the 2D overhead view of your landscape design. Learn how to pan and zoom with ease. Editing Points allows you to change the shape of most shape-based landscaping objects. Use Realtime Landscaping Photo to design a landscape on top of a picture. Use the Google Maps Import Wizard to design over a satellite image. A Fill Region is used to add grass, mulch, or other ground cover. A Path is used to place a walkway or trail. Edging is used to add adjustable borders to planting regions and other features. Hedges are used to add box hedges of any shape and size. Accessories include more than a thousand different objects, ranging from patio furniture to golf carts. Landscape Lights are used to add garden and accent lights to your landscape design. Small rocks and large boulders can be added using the Rock object. Rock Borders are used to create automatic strings of rocks. Pictures are used to add 2D images to your landscape. Thousands of different plants can be added to your landscape. The Plant Fill object allows you to populate an area of your landscape design with plants. The Plant Row object allows you to create a string of plants that follow a path. The Pond object is used to create water gardens of different shapes and sizes. Use the Pond Wizard to quickly add a pre-built water garden to your landscape design. Streams can be added to enhance your water garden design, or to visualise a natural creek. Streams can be added to enhance your water garden design, or to visualize a natural creek. Many different types of waterfalls can be added. Waterfalls emit flowing water in the Realtime Walkthrough. Many different styles of fountains can be added. Fountains will spray or gush water realistically in the Realtime Walkthrough. Jumping Jets are small pressurized water emitters used to create stunning water garden effects. Add an adjustable line that represents an underground sprinkler system. Sprinkler heads emerge from the ground to shower the surrounding landscape with water at a selected angle and radius. Add a 3D house to your landscape design. Use the House Wizard to add a 3D house to your landscape. Learn how to add doors, windows, house lights, and columns to your design. The Fence and Fence Gate tools are used to add customizable wooden and vinyl fences and gates. The Panel Fence and Panel Gate tools are used to add a wide range of metal fences and gates. Add wooden or composite customizable decks and deck stairs. Use the Deck Wizard in Realtime Landscaping Pro to build a deck. Learn to use the standalone railing tool. Create detailed patios to complement your landscape design. Learn how to create two styles of covered porches and a covered patio. Add customizable patio steps to your landscape design. Add customizable patio steps to a slope. Learn to use the powerful Retaining Wall tool for use in your designs. Use the Accent Strip tool to add concrete, paver, or brick accents to your designs. Add decorative shapes to your patios and regions using the Accent Shape tool. Use the Accent Wizard in Realtime Landscaping Pro to create patio accents. Detailed swimming pools include realistic water and user-friendly customization options. Use the Swimming Pool Wizard to quickly add a pre-built sample swimming pool. Pool Decking is used to create the foundation that most in-ground swimming pools are set within. Pool Stairs are used to add steps inside a swimming pool or spa for use in entry and exit. The Pool Seat object is used to create seating platforms inside swimming pools or spas. Pool Walls and Spillways are used to enhance swimming pools and spas. The Pool Light object is used to place a light onto pool decking or within a swimming pool or spa. Pool Accessories include swimming pool and spa objects, such as ladders, handrails, pool toys, and more. Realtime Cameras are used to create the path the camera follows when creating movies and automatic walkthroughs. Learn how to use the 3D Text object to add signs and labels to your landscape design. Learn how to use the 3D Dimension object to display distances on your landscape design. Design a house over a 2D plan using an overlay. Add boundaries that can be used as property lines as well as section off specific areas of your landscape design. Bring your landscape designs to life with 3D animated characters who stand, walk, run, and more. Import a custom photograph or image into Realtime Landscaping Pro. Import a custom 3D model from a SketchUp or 3DS file. Create a list of objects used in your landscape design to aid in determining what needs to be purchased and the total cost. Learn how to subtract the shape of one object from another. Learn how to organize items in your design into sets called “layers”. Learn how to use the Page Setup settings and how it affects printing. Learn how to add a simple or curved slope to your landscape design. Learn how to add a lattice of points to your design that can be adjusted in elevation. Learn how to sculpt the terrain using an image. Learn how to raise, lower, flatten, and smooth the terrain by “painting” the desired elevation changes. Learn how to draw a shape into your terrain that can be raised or lowered as needed. Learn how to adjust the elevation of walkways, driveways, and more. Learn how to add cubes and rectangular solids for use in custom models. Learn how to add sloped solid shapes for use in your custom models, or as standalone objects. Learn how to add smooth or faceted cylinders of any shape and size. Learn how to create a 3D object by drawing a 2D shape and then “pulling” it out. Learn how to create a 3D object which is based on the revolution of a 2D shape. Learn how to create complex 3D objects by extruding a shape along a modifiable path. Learn how to add various simple 3D pieces that can be used alone or as part of a custom model. Learn how to convert nearly any object into a “Custom Model” to enable advanced editing options. Learn how to cut away sections of objects. Learn how to add a custom circular patio. Learn how to add a custom inset fireplace. Learn how to add custom string lights.